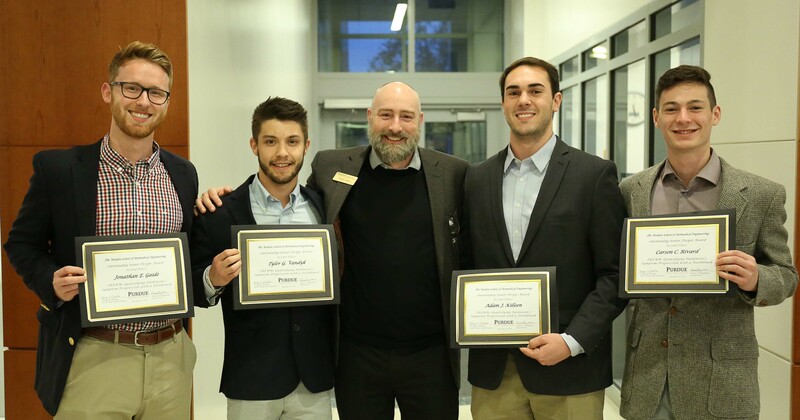 Four senior design teams were recognized for outstanding achievement at the annual Purdue University Weldon School of Biomedical Engineering Senior Design Projects Presentations and Demonstrations. 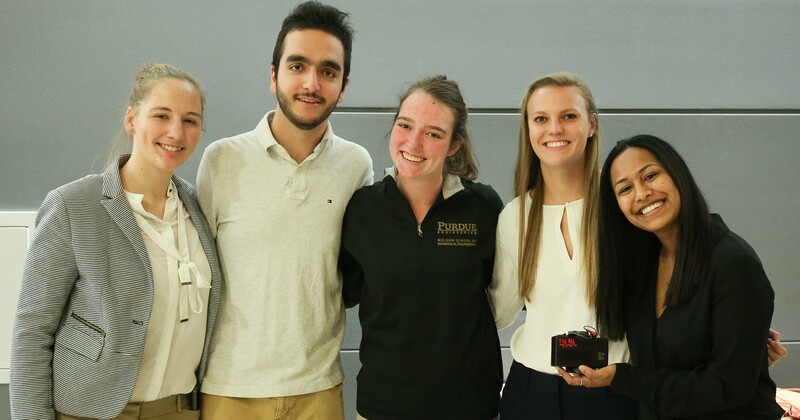 On Dec. 13, 18 teams presented innovative engineering solutions to address various real patient, clinical, and healthcare needs to an audience that included the teams’ industry and clinical partners, the Purdue community, and the public. The senior design course instructors awarded First Place to the HANA: The Heart Attack Notification Agent team. The team developed a portable, at-home heart attack detection device that notifies users if signals obtained by the device indicate a heart attack. Team members were Carissa Nel, Ahoura Mortazavi, Madeline McLaughlin, Anna Fuquay, and Shazana Nadeem. Two teams tied for the Second Place award. TREMM: Quantifying Parkinson’s Symptom Progression with a Toothbrush comprised team members Jonathan Gaide, Tyler VanDyk, Adam Killeen, and Carson Rivard. The team embedded a motion tracking system into an electric toothbrush. The device tracks the severity and progression of Parkinson’s Disease. Corey Linkel (center), associate director for undergraduate programs, presented the awards. Second Place also went to the Reduction of Occupational Shoulder Injuries in Sonographers: Shoulder Stabilization Team. 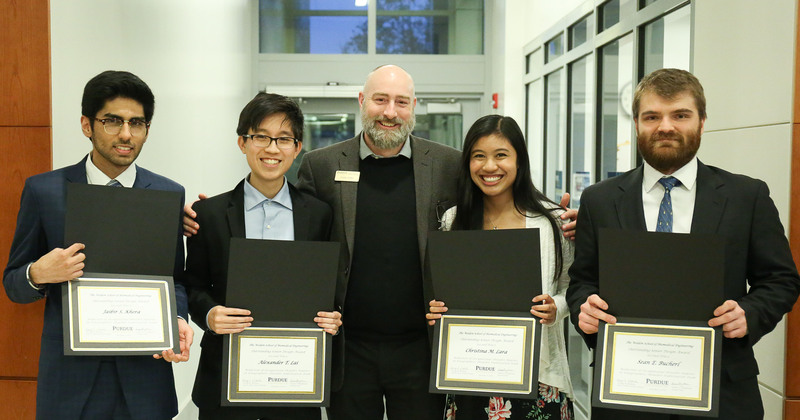 Members included Jaibir Khera, Alexander Lai, Christina Lara, and Sean Bucherl. The team developed an arm shelf that sonographers can use to rest their arm upon during lengthy procedures to help prevent shoulder injuries incurred by sonographers. 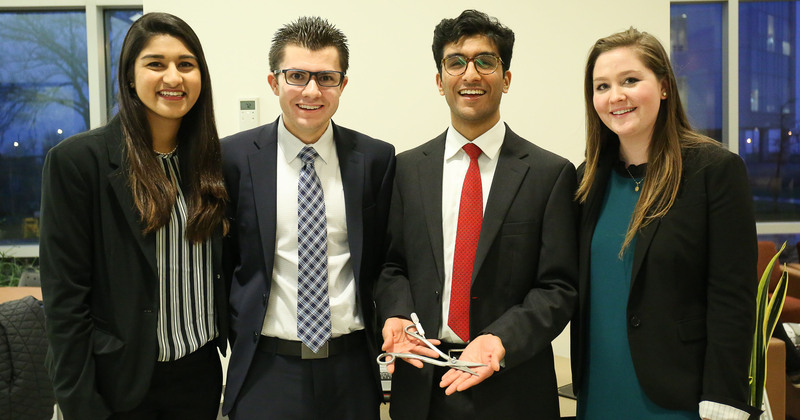 The People’s Choice Award was selected by the audience and went to the Surgical Pocket Dissector for Cardiac Implants team, comprising members Ashlyn Twibell, Dimitri Pecoski, Nikhil Dave, and Mahera Husain. The team developed a handheld, spring-actuated device that can be used to create size-specific surgical pockets for implantable cardioverter defibrillators. Visit the Senior Design webpage for more information about senior design at the Weldon School of Biomedical Engineering. The school welcomes submissions of project ideas and industry and clinical team sponsors and mentors.